It has been such a long time since my last school update for Hayden. As you can imagine life is busy between my two littlest loves. Hayden has been in school for a little over two months. He went from 2.5 hours of school to about 7 hours ! Boy do I miss him, but he loves it. I admit I was extremely nervous. We left everyone we loved and who Hayden loved. However, this has been a great change for Hayden. I had his first kindergarten IEP meeting. I dread those. Not because I am not prepared it is because I am listening to all the challenges Hayden faces. I always bring to the meeting some goodies and a letter about Hayden. I want them to remember we are talking about an individual child. For the most part we were on the same page. Some of my ideas the team already included in his updated IEP. I love that he has some of his same therapist/teachers. They truly have been able to see him grow. Our biggest hurdle still is gross motor. While he has improved there is transition time. I felt they definitely are allowing it but it still seems some feel it will present problematic in elementary school. At the end of our meeting a wheelchair was brought up. I get it and understand why the school feels it's the right choice. As a family we are not at that place to say yes we agree. Hayden is walking and keeping up with his peers. Sure it requires extra hands. I hope that will be less and less as he gets older. I still respectfully said no and will continue to fight. My answers are not always the most popular, but I know what my child needs. What we want the most is for school to always be on the same page and always support our goals. May you always be our comedian and continue to make us laugh. I hope you always remain happy and stay innocent to the negativity. I hope you always continue to work hard and show the world yes you can. I love your smile, your laugh, and your hugs. You are part of my heart always. A year later after Julia's hospital stay and encephalitis rocks our world. 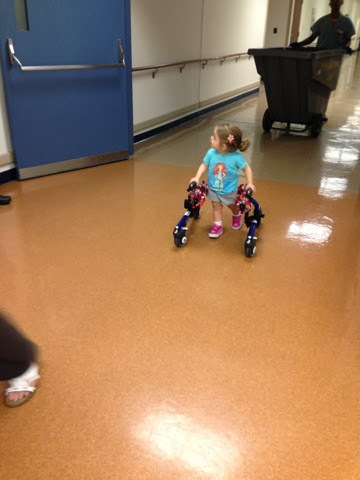 Julia has recovered mostly accept for independent standing and walking. Reality has set in how lucky we are to have our baby girl and just how different our lives are now. Being a mom of one special needs child changed me and I didn't think there was more changing but there sure is. The process of IFSP ( individualized family service plans), doctor appointments, therapy and research has doubled. Today, Julia and I ventured to AI our home away from home for physical therapy. I know you at wondering what is different about today's visit than any others? Today we went with a walker in tow for Miss Julia. A walker that I had to accept again for another child. I had a brief moment of not wanting a walker. That was short lived when I saw her just go. 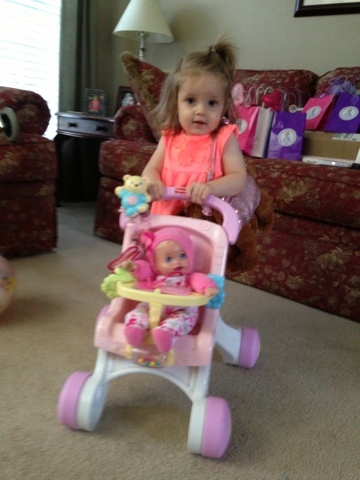 She got in that walker and knew exactly what to do. Of course being Julia her walker must have a ton of glitter. Luckily, her therapist from Easter Seals understand my little ones sassy personality and decided to help her make it pretty. Julia spent an entire hour working hard in physical therapy. Harder than a two year old should. She desperately wants to run and play. Her mind believes she can do it however, her body is still trying to catch up. After her session I was amazed with this little girl. 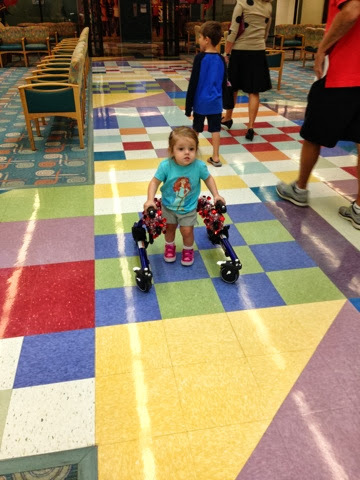 She refused her stroller and walked from pt, which is on the ground floor to the hospital entrance on the first floor. Sure it took us twenty minutes. My children sure know how to ground me and force me to slow down. Slowing down was nice. I got to see her joy and how proud she was walking like a big kid. I also have another social butterfly stopping to say hi to everyone. AI DuPont is truly a special place for us. This hospital saved my baby girl. This hospital is our second home. What makes this visit special is all the encouragement I received from other families, staff, physicians and nurses. One doctor stop to say hello and to tell me Julia rocked that walker. He said I can't imagine her needing it long. I sure hope his prediction is right. I keep hoping and trying to pray to whomever is listening to heal my baby girl. I wish she didn't have to work so hard. I wish she never got sick and contracted encephalitis. More than anything I wish for continued improvement. Encephalitis is tough and such a scary condition. It brings new worry such as vaccines, worrying if people she is around have received live vaccines, are people sick, and understanding seizures. I will end this post with some photos of today. Sitting here writing this post seems a bit surreal to me. It is hard to believe on August 22, 2012 my sweet baby girl and I were getting discharged from AI Dupont Hospital for Children. Being a mother prepares you for many things, but I do not think it ever truly prepares you for your child being admitted to the hospital. I do not think you every truly get what that feels like unless you have been in the situation. Having one child who has a rare medical condition has made me more aware of things but, being hospitalized was unchartered territory for me. I am also amazed just like her birth I remember clearly every moment of our stay at AI. I remember how scared I was and I also remember how I needed to be strong for my baby girl. We went home after a week stay with a diagnosis of Meningoencephalitis and post viral cerebellar ataxia. Ataxia was familiar to me however, I truly did not know what encephalitis meant or what it meant for Julia. Yesterday, we went to our one year follow up with Dr. Bodak. As any mother would be I was apprehensive of what this appointment would bring us. Julia has recovered remarkably well in a year. When she was first admitted to AI she lost everything a typical 12 month old child could do. Julia had to relearn head control, how to sit, how to sit unsupported, how to crawl, how to pull to stand, and cruise. Julia had to regain fine motor skills such as picking up small objects and even her pincer grasp. I am happy to report Julia has in fact regained those skills. Julia has regained those skills and is cruising and climbing everywhere. Julia has taken independent steps in the pool and has stood independent for a few seconds. She is starting to talk more and really, really wanting to walk. Right now Julia is walking holding our hands, cruising the furniture/walls, or using a baby doll stroller or shopping cart. She has even started to bear crawl, which is quite a talent. I went to our appointment with Dr. Bodak to report these amazing things, but I knew we still have things to work on. Her neurologist was quite pleased with her progress, but she told me she still has some time to recover. It could take many years. We just don't know how long because the brain is an amazing thing. Julia still struggles with balance, which seems to be residual from what part of her brain was infected by the virus. She feels Julia will be able to walk on her own, however will more than likely need a cane or a cool walker like her brother before she steps out on her own. What I did not expect to hear is just how serious this particular infection was. I think the doctors spared me the worry considering we have experienced some trying times already. Now, that we are a year out I think they are comfortable in letting me know just how lucky we are. You know what we are lucky we still have our beautiful baby girl to wake up to every day. The other news is Julia's MRI is normal now and is showing re myelination. This is a huge win. We wanted to see this happening. However, Julia's EEG's are still a bit abnormal. Little did I know she experienced a seizure before we got to the hospital a year ago. So, I went home yesterday with a prescription for Clonazepam. 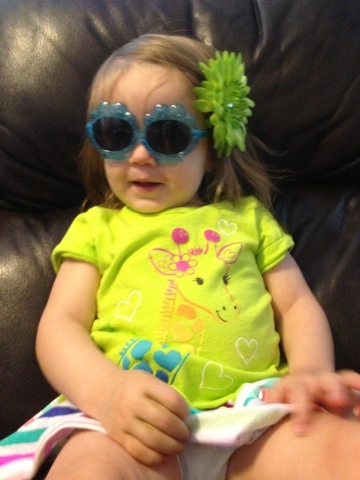 Now, this mom needs to learn about epilepsy and educate everyone that watches our baby girl. We also were told again no vaccines for Julia except for the flu vaccine. I use to think that it was crazy to not give vaccines. Now, I understand why parents make those choices. I won't get into a vaccine debate, but I will say I apologize for misjudging those who made the difficult choices for their children. Overall, this appointment was good news and we still have a road ahead. Where it will lead is Julia's destiny. I am glad I waited a day to write this update. I had some mixed feelings about yesterday. I wanted to hear from our doctor those magic words that she is 100% recovered that I didn't have to worry as much about Julia. However, those worries will still be there because I am a mom. Every parent worries about their children no matter what the situation is. I just worry a bit more because of the fragile medical conditions my children carry. I also had a brief moment of is this really happening again? I quickly reminded myself not to let myself feel angry about this. After all she is my beautiful, sassy, independent Julia. If anything this makes me more grounded. More understanding of what is important in life. I understand that it is okay to slow down and jump in water puddles even if we ruin our shoes. I understand that if my house is not as perfect as I like that is okay. I understand that waking up to hugs and I love you is pure joy. I even understand those moments when both my children are yelling mommy and asking to be held that is okay. I also understand that even if I get frustrated at insurance companies and spending my time in therapy that is okay too. I also am glad that I share our story because I hope it inspires just one person, I hope it educates even one person, and I hope that more than ever it reminds everyone that everyone has uniqueness. I want to end my post about Julia and how she brightens up our lives. Her love of sunglasses, shoes, nail polish, pink, babies, and dogs. Her total admiration of Hayden and the way she says his name. The way she makes barking dog noises when she sees our dogs or any dog. 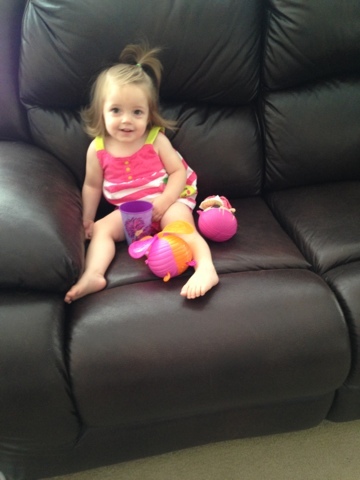 The fact that she wants to be such a big girl and do everything on her own. The way she climbs on everything which includes our baby gates. Her tantrums because she doesn't get her way. That she is girly but will play with race cars with her brother. The way she decides to stand up in shopping cart seats. The fact that she refuses to sit in a high chair any longer at restaurants. I love when she calls her bike her bite. The way she needs her mommy even if I want a minute to myself. I still love this. If you made it to the end of this post, thank you! Thank you for your interest in our amazing children. 2033 days later we are diagnosed! I have been waiting for such a long time to say and type these words. Hayden is diagnosed. After researching, seeing nine specialist, visiting two hospitals, two MRI's of the brain, and multiple DNA analysis we finally know. It took me a few days to gather my thoughts and truly believe this is it. I am at peace with knowing. All I ever wanted to know is what caused Hayden's delays. 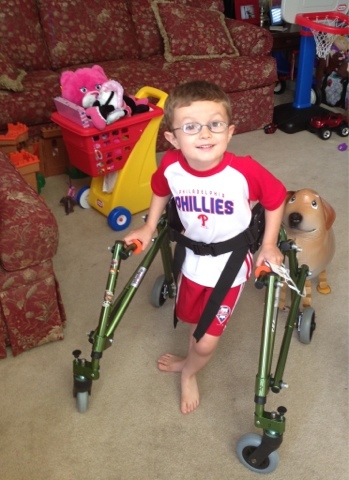 Tuesday Bob, Hayden and I went to see Dr. Lynch a neurologist, who specializes in ataxia, neuromuscular diseases and rare syndromes/diseases at Children's Hospital of Philadelphia. Heading into this appointment I prepared myself not to expect miracles. To know we will probably hear thoughts, references to characteristics of xyz syndrome, and even a we may not ever know. Instead the exact opposite happened. When we arrived at CHOP Hayden was extremely excited to get to walk in a parking garage, ride in an elevator, watch all the construction and talk to new people. I truly was apprehensive about this visit I had been tainted by my initial struggle to even get an appointment, but everything changed. The moment we arrived check in was quick and even checking Hayden's weight, height, temperature, and blood pressure ran smoothly. Hayden wanted to look out the window and watch all the construction. Finally, 11:30 arrived and I thought I am sure we would wait. Boy was I wrong! I heard someone call Hayden's name. I assumed it was a member of Dr. Lynch's staff. A kind man walked over to meet us and said "Hi, I am David Lynch". I looked at Bob in complete amazement. We ran on time and the doctor came to greet us himself. He already knew about Hayden from speaking to his current neurologist at AI and from reviewing all of his medical information. When we arrived in the room we went over some questions, he examined Hayden, had Hayden walk and then asked Bob and I what we see Hayden doing in twenty years. Without hesitation we laughed and said definitely a politician. Dr. Lynch laughed and said is that a good thing? We had to fill him in that Hayden is everyone's friend, loves people and certainly loves being on stage. He then left the room to gather his thoughts with his colleague. Again, not anticipating an answer he came back and gave us just that! 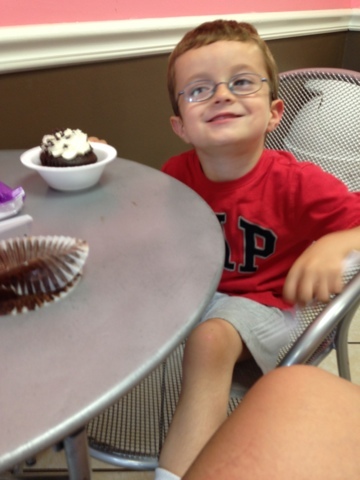 We knew our little man was special, but now we can add rare as another adjective to describe Hayden. Hayden has a condition called congenital cerebellar hypoplasia. Yes, it is rare, but it is not progressive, which is what we wanted to hear. I also needed to hear it was not my fault, it is not genetic and Julia is not impacted. I am sure you are wondering what exactly is cerebellar hypoplasia. Quite simple it is a small cerebellum. Now, we knew something was not normal about Hayden's cerebellum but now we have the name of the condition. To put it into perspective Hayden makes number 16 that this doctor has seen. There is not much out there about what to expect. There is information on the progressive form which I am thanking our blessings we do not need to worry about. I think the best thing this doctor told us was enjoy Hayden. Stop the testing and involve Hayden in as much as we can. Now, we focus on physical therapy and participating in the Special Olympics. Dr. Lynch did more than he can ever understand he assured me Hayden is going to be a productive citizen and maintain a job. All I ever wanted is to know Hayden has nothing scary and that he will be independent. My heart and mind are relieved. I can stop spending days and nights wondering what I did wrong or will we ever know. 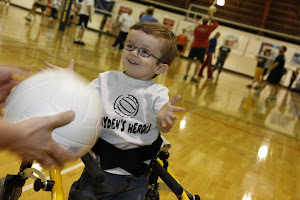 I can look at this wonderful little boy and feel confident Hayden is going to be okay. Right now I am going to take advantage of my sweet boy who loves therapy and figure out how insurance is going to allow more for him. I also now can focus on getting the right team behind him that shares our views for Hayden. I can celebrate the little joys and cherish the moments he is still my baby boy. I am so proud of Hayden and cannot wait to see all he accomplishes. My little love bug I cannot believe another year has flown by. Wow, you are already two. Your second year started off pretty scary. We were so fearful of how your little body was going to recover from such a scary infection. However, you have proved us wrong and you showed me how to believe miracles happen. Every day you fight. You fight to get stronger and fight for your sassy little independence. I love how strong willed you can be. Amazing what a year could show us. You love life and love our little family. I am often surprised at all the little things you love. You love pink. Everything must be pink from your toe nails, clothes, and shoes. If it sparkles you love it! Purses, shoes and sunglasses are pure joy. I love the way you balance being extremely girly but enjoy playing cars with Hayden. I love the way your smile lights up the room. The way you say daddy melts my heart. I love the little barking sounds you make when you see your doggies Cody and Sophia. Our snuggles I do not ever want to let go. Baby girl you are so independent and so brave. You are definitely no one other than Julia. I hope you always stay independent and love able. I hope you continue to see the beauty in the simple things in life. I hope you stay sassy and decorate the world in pink. I hope you still love to paint and play with your brother every day. I hope you know how much I love you. How much I wish I could take away how tough this year has been. I want you to always remember how proud I am of you. I cannot wait to share many more toe nail, shoe shopping, pink and glittery days with you. Words cannot express how much I love you. You are my sunshine. Happy 2nd birthday my sweet Julia! I love you!! We have a big independent kindergartner! I cannot even believe those words as I type them. Hayden's last day of preschool was emotional for me. I was sad we were leaving his wonderful teacher and para. I struggled that my baby is no longer a baby. He truly is a boy growing up to quick. There has been so many ups and downs the last 2.5 years. We have had some trying times with a suggestion of a wheelchair or his walker not working for the classroom. However, those trying times are far outweighed by wonderful moments. Hayden is talking well, he is able to identify colors given choices, he can write a letter H, draw a person, draw a house, has a vivid imagination, and most importantly he can walk in his walker keeping up with peers. When I first took Hayden to preschool he was just getting the hang of his crocodile walker. Since that moment he has graduated to a lighter weight walker a Nimbo. This walker allowed Hayden the freedom he desired so much. He runs, he plays, and best of all he is proud. He is proud to walk in the stores and nothing is stopping him now. This post about preschool would not be complete without me talking about Hayden's teacher and para. We love them dearly. I really struggled with the fact we would not see them every day. That someone new has to learn about Hayden. I do not know how anyone would love him the way his current teachers do. I still worry. I still want to know his favorite people in the whole world outside of his family will see him everyday. I felt safe knowing they got Hayden. Most of all I found people who believe in him and who were not scared of his disability. They saw Hayden as a typical five year old boy. He was not treated different and I cannot thank them enough for being so wonderful to our son. I know we will forever hold them in our hearts and we will keep in touch. They were so critical to Hayden's success the last few years. Hayden just finished another year of baseball. He had such a great time playing on the Phillies. He definitely looked forward to every game. As you may have guessed Hayden was quite the ladies man. Whenever we had female buddies you can bet Hayden had a few playing with him. I am not sure if I should be worried that my five year old has a way with the ladies already. Unfortunately, he was not able to finish his last two games since he sprained his hand, but he definitely is looking forward to next baseball season. 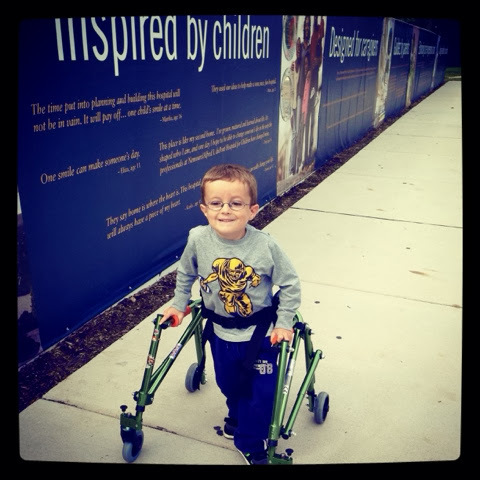 A few posts back I wrote about some more genetic testing for Hayden. For those following Hayden's story we really do not know what is causing most of his delays. 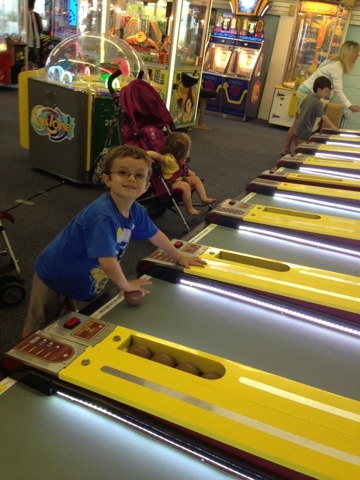 We do know he has a underdeveloped cerebellum, suffers from hypotonia and ataxia, and has some vision difficulties. 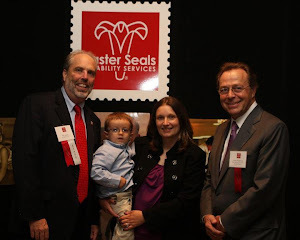 We have been through two MRI's, two genetics doctors, vestibular testing, micro arrays, muscular dystrophy testing, PMD testing, other scary disease testing I fondly call (the M word), and most recently we completed a hereditary ataxia panel. After several weeks of waiting, which is the worst part we finally heard from our neurologist. All the testing came back normal. Normal is great news but normal is also frustrating news. I am relieved he has nothing life threatening, but I wish I had a reason for his delays. For his future I feel it is important to still search for an answer. I had a conversation with his neurologist and we decided it was time to consult another neurologist. This time we are headed to Children's Hospital of Philadelphia. This will be the forth neurologist Hayden has seen and I am hoping he might have some new ideas or he might finally just reconfirm that what we are dealing with is an unusual form of cerebral palsy. Stay tuned to our neurology updates. I want to end this post on some hopeful news. Hayden had an orthopedic doctor follow up on Monday at AI Dupont. We love Dr. Mackenzie! He truly embodies everything a children's physician should be. He is kind, he is optimistic, and he treats you as if you are his only patient. He examined Hayden and we were shocked to learn Hayden grew 4 inches since December! I knew he got bigger but four inches wow! He was so impressed with our little guy. 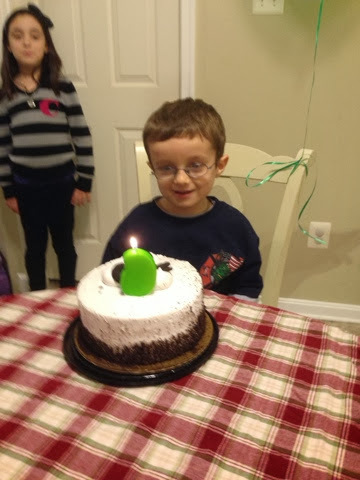 He could not believe how strong he has gotten and how fast he has gotten. 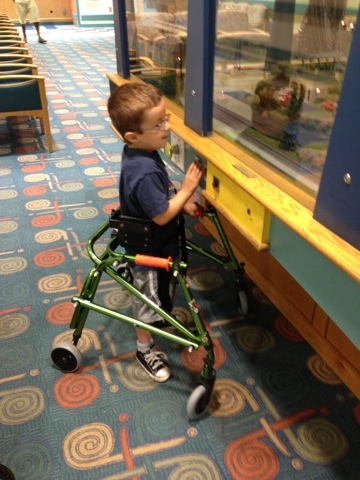 Hayden loves to walk around the muscle clinic hallways to pass time. He also loves to stop and socialize with everyone. I mean everyone nurses, doctors, students, patients, cleaning staff, and the list goes on. The muscle team knows Hayden by name. Not sure if it is because he is very outgoing or because he is a mystery. Anyway, we met with Dr. Mackenzie who spoke of all the things Hayden has accomplished in a few short months. It's hard to realize how far he has come when I see him every day. I was thankful he pointed out these little inch stones to me. Dr. Mackenzie looked at me and said this little guy is going to walk independent. I looked at him and said really without a walker? I have always been hopeful but I am cautiously optimistic. He has improved so much and I dream that there is a day things are easier for him. But hearing those words from Dr. Mackenzie made me smile and made me hopeful. He said there is not a time limit on when someone has to graduate from using a walker. It is going to be when Hayden does it and when he can control his balance. Little did he know how much hope he gave me. Even for a five minute conversation I had hope. I wanted to hug Dr. Mackenzie but I thought it was best I did not shock him with a hug from an emotional mama. I still am beaming about our visit to AI yesterday. From the time Hayden stepped out of the car in his walker. He walked with me I did not need to direct him or slow down. We made it from the entrance and upstairs in 10 minutes. 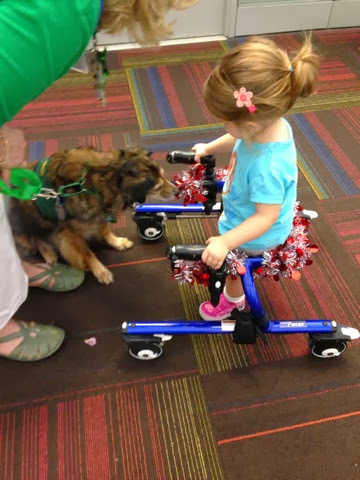 He even stopped to see a therapy dog at the hospital. She was a chocolate lab and we all know our family is obsessed with labs. 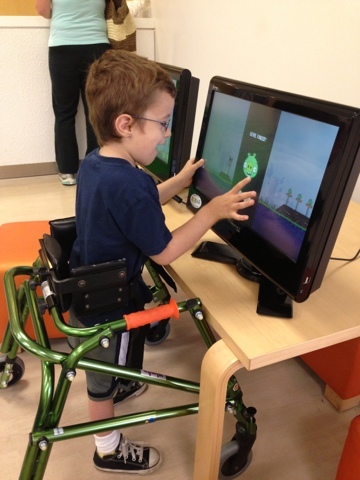 We arrived at the muscle clinic in time for him to play angry birds which made his day. After his appointment we had to head to Lawall's to have his brace fitted. 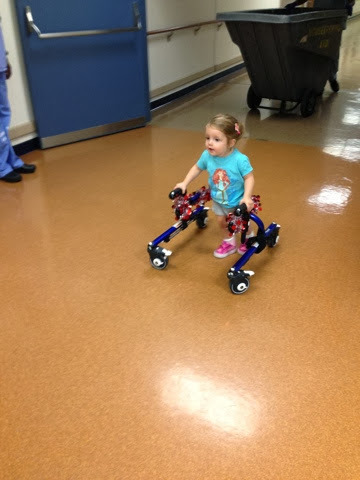 Hayden walked again. Once we got to Lawall's Hayden tells the receptionist " I am here where is Mr. Gary?" she said he is with someone now. Hayden tells her that is fine I will walk around some more. My boy who struggled 2.5 years ago to keep up wants to walk around some more! Until next time.... Thank you for continuing to follow our story! Thank you for letting me share our accomplishments and joys.